MyBonBons by Nomination is a collection of high-quality personalisable jewellery. Create your trendy accessory just the way you want: choose either a single-strand or multi-strand coloured leather bracelet and add your favourite charms. 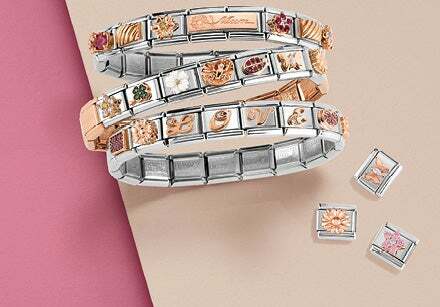 Among the MyBonBons options, you’ll find stainless steel charms decorated with symbols in yellow gold, rose gold, gemstones and enamel. Looking for a personalised gift idea for someone you care about? Thanks to MyBonBons letter charms, you can write their name onto a one-of-a-kind bracelet. Want to let the world know who you are through your accessories? This collection includes all kinds of symbols to decorate your jewellery: you’ll find charms with flowers and with zodiac signs, as well as good luck symbols and charms dedicated to love, which are perfect for creating romantic gifts. For jewellery that’s precious and shines bright, choose charms decorated with coloured Cubic Zirconia. Create your bracelet and show the world who you really are, or create an original gift for someone special: all Nomination jewellery is guaranteed Made in Italy.